Tamarind juice – 7-10 tbsp. · Clean bitter gourd, scoop out seeds and cut into small pieces. 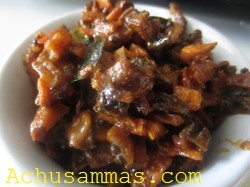 · Fry the bitter gourd pieces and coconut slices till golden brown and keep it aside. 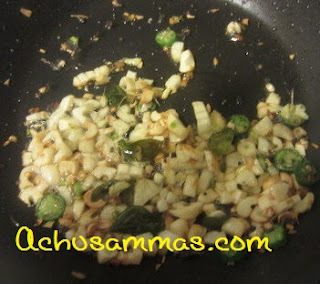 · Heat oil in a pan add mustard seed, when start to spluttering add garlic,green chilli,fenugreek seedand sauté till garlic become lightly brown. 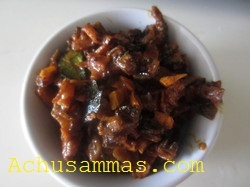 · Add turmeric powder,chilli powder ,pickle powder and sauted a while and add fried pavakka coconut into mixture. 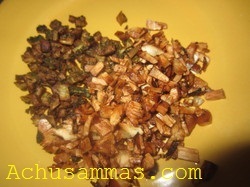 · And mix well and add tamarind juice,salt and mix well.Switch off flame when it became desired consistency. Bitter gourd, tamarind and hing are items I've never seen around here, but I'll take your word that they combine to form a delicious dish :) Have a wonderful day!!! So unique and interesting combo !! lip smacking pickle !! Very tempting pickle..yummy,adding coconut slices is new to me..reduces the bitterness,I think!! Cool that you can get your hands on actual pods and seeds when it comes to spices, I know it must make an big difference in the flavor! This recipe does have some interesting and tasty flavor additions. Also, there is a new ingredient here that I really want-pickle powder. Besides that I sure could use a taste of this dish! Enjoy the day. A new interesting recipe. Lovely dish. Well done! Ooh, this is awesome, have never tried pickle with pavakkai..
very new recipe...but sounds so yummy...great recipe,thanks for sharing!! 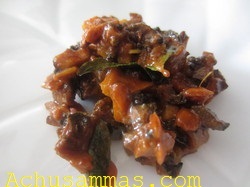 Nice recipe dear..will be yum yum with bowl of curd rice :) New recipe to me!! such an interesting use of pavakkai! i'm sure all the bitterness would have gone away! You have an award at my space,please come & grab,dear! !